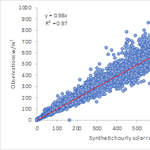 A stochastic model for the hourly solar radiation process for application in renewable resources management A stochastic model for the hourly solar radiation process Giannis Koudouris et al. Since the beginning of the 21st century, the scientific community has made huge leaps to exploit renewable energy sources, with solar radiation being one of the most important. However, the variability of solar radiation has a significant impact on solar energy conversion systems, such as in photovoltaic systems, characterized by a fast and non-linear response to incident solar radiation. The performance prediction of these systems is typically based on hourly or daily data because those are usually available at these time scales. The aim of this work is to investigate the stochastic nature and time evolution of the solar radiation process for daily and hourly scale, with the ultimate goal of creating a new cyclostationary stochastic model capable of reproducing the dependence structure and the marginal distribution of hourly solar radiation via the clearness index KT. Koudouris, G., Dimitriadis, P., Iliopoulou, T., Mamassis, N., and Koutsoyiannis, D.: A stochastic model for the hourly solar radiation process for application in renewable resources management, Adv. Geosci., 45, 139-145, https://doi.org/10.5194/adgeo-45-139-2018, 2018.
where z∈0,1 is standardized according to z=z-zmin⁡zmax⁡-zmin⁡, with zmin⁡ and zmax⁡ are minimum and maximum values determined from the empirical time series. Figure 1Double periodicity diagram of Solar radiation (i.e. averaged measured value for each hour) for Denver station. In this research framework a more extensive analysis is being conducted for hourly solar radiation. The marginal distribution for hourly scale and the dependence structure of the examined process are being investigated with the ultimate goal to synthesize a preliminary cyclostationary stochastic model capable of generating synthetic series calibrated from regional climate data. Furthermore, one the most common characteristics of hydrometeorological processes is the double periodicity (i.e. the diurnal and seasonal variation of the process); therefore, solar radiation exhibits same behaviour (e.g. Fig. 1). The seasonality occurs due to the deterministic movement of the earth in orbit around the sun and around its axis of rotation. The index can be considered as a ratio of both deterministic and stochastic elements. The clearness index KT, describes all the meteorological stochastic influences (e.g. cloudiness, dew point, temperature, atmospheric aerosols) as it is the ratio of the actual solar radiation measured on the ground I, to that available at the top of the atmosphere I0 and so it accounts for the transparency of the atmosphere. Therefore, investigating the stochastic nature of clearness index KT can lead to conclusions for the fluctuations in hourly solar radiation. The analysis of hourly solar radiation is conducted via the clearness index KT. In order to examine the process behaviour on a world-wide scale, data from both United States of America and Greece are examined. Data for Greece were retrieved from the Hydrological Observatory of Athens (HOA). The network consists of more than 10 stations located in Attica region measuring environmental variables of hydrometeorological interest. Each station is equipped with a data logger which records with 10 min interval. These measurements were aggregated to mean hourly data through the open software “Hydrognomon” (http://hydrognomon.org, last access: 9 August 2018). For the Attica region, the KT timeseries were generated utilizing Eq. (3) by producing hourly solar top of atmosphere intensity at the local station. For USA, the data base of NRLE (National Renewable Energy Laboratory)-NSRDB (National Solar Radiation Database) was used, which contains more than 1500 stations with hourly solar radiation, but only 40 of them include time series with more than 14 years of measurements of hourly global solar radiation measured on horizontal surface. The parameters are calculated via the least square estimator method or the maximum likelihood estimation. The resulting f(x) and F(x) exhibit good agreement with the empirical ones (e.g. Fig. 2),notably when solar radiation exhibits a bimodal behaviour (e.g. Fig. 2c, b). 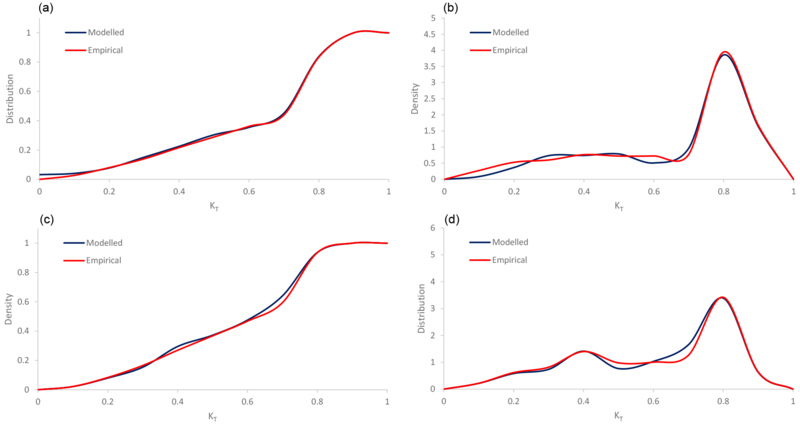 Figure 2Examples of comparison between empirical and theoretical distribution, where the latter is a linear combination of Kumaraswamy distributions. (a, b) Psitallia station, Greece (bimodal); (c, d) Barrow station, Alaska (unimodal). It is well known from the literature that hydrometeorological processes show a large variability (often linked to the maximum entropy; Koutsoyiannis, 2011) at different time scales, exhibiting so-called long-term persistence (LTP) or else the Hurst-Kolmogorov dynamics (Koutsoyiannis, 2002). In order to investigate if solar radiation exhibits an LTP behaviour, the Hurst parameter (representing the dependence structure of the process) is estimated via the climacogram tool (i.e. double logarithmic plot of variance of the averaged process versus averaging time scale k; Koutsoyiannis, 2010). The Hurst parameter is identified only at large scales. Thus, in Fig. 3, it is identified for time scales >1 year (8760 h), where the seasonal variation is averaged out and equals the half slope of the climacogram, as scale tends to infinity, plus 1. The climacogram has some important statistical advantages if compared to the autocovariance and power spectrum (Dimitriadis and Koutsoyiannis, 2015a; Harrouni et al., 2005). Exploiting the Hurst parameter, the persistence behaviour of the process is quantified and examined. The analysis of both NSRDB and HOA stations estimates the Hurst parameter larger than 0.5 (where the latter value corresponds to a white-noise behaviour); consequently, the examined process indicates long-term persistence and cannot be considered as white noise nor a Markov process. Figure 3Climacogram of three investigated stations: Denver, H=0.78, Elizabeth city, H=0.75, Bluefield Virginia, H=0.64. 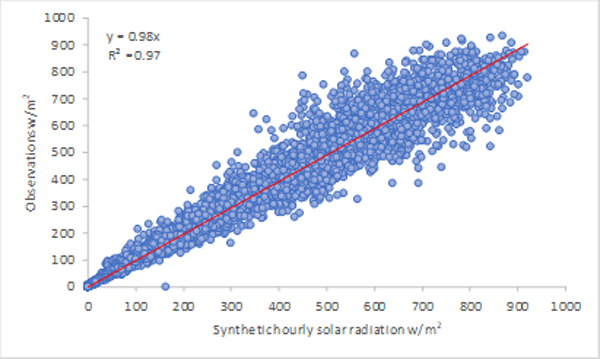 Figure 4Results of the simulation model for the Denver Station: (a) 2-year synthetic timeseries of hourly KT; (b) yearly average of hourly solar radiation observations vs. synthetic values of 15 years simulation. In this section, we describe a simple methodology to produce synthetic hourly solar radiation. After we cautiously select a marginal distribution model (e.g., Eq. 8, Fig. 5), we estimate the distribution parameters pi,j for each diurnal-seasonal process xi,j (e.g., 12×24 different set of parameters; Fig. 4). Then we homogenize the timeseries (Dimitriadis, 2017) by applying the distribution function Fxi,j;pi,j to each one of the diurnal-seasonal processes (with the estimated, e.g. i=12×j=24, set of parameters pi,j) and then, by employing the standard Gaussian (or any other) distribution function to each diurnal-seasonal process, i.e. y=N-1(F(xi,j;pi,j);0,1). Note that in case the diurnal-seasonal processes are all Gaussian, the proposed homogenization is equivalent to the standard normalization scheme, where for each process the mean is subtracted and the residual is divided by the standard deviation. In this implicit way, we manage to homogenize the timeseries xi,j∼F(xi,j;pi,j) to y∼N(0,1). In case where the marginal distribution is unknown or difficult to estimate, we may use non-linear transformation schemes based on the maximization of entropy (Koutsoyiannis et al., 2008; Dimitriadis and Koutsoyiannis, 2015b). It is noted that a more robust approach to reduce the 12×24 set of parameters would be to employ an analytical expression for the double solar periodicity (as done for the wind process in Deligiannis et al., 2016). This homogenization scheme has been applied to several processes such as wind (Deligiannis et al., 2016), solar radiation (Koudouris et al., 2017), wave height, wave period and wind for renewable energy production (Moschos et al., 2017), river discharge (Pizarro et al., 2018) and precipitation (Dimitriadis and Koutsoyiannis, 2018). However, it is noted that this scheme assumes stationary in the dependence structure rather cyclostationary (for such analyses see Koutsoyiannis et al., 2008, and references therein). Figure 5Comparison of distribution (a, c) and density (b, d) function of simulated and observed data, for hour 13:00: (a, b) May; (c, d) September. 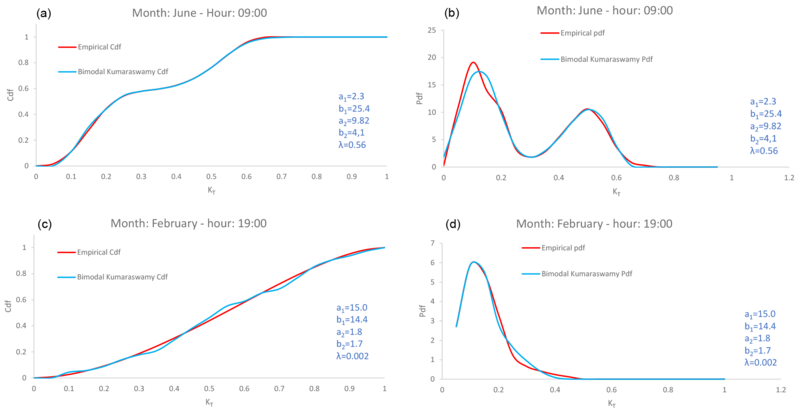 Figure 6Lag-1 autocorrelation of hourly time series for each month (a) empirical; (b) simulated. where γ is the standardized variance, k the scale (h), q a scale-parameter and H the Hurst parameter (for the examined process we estimate q=2 and H=0.83, considering the bias effect; Fig. 7). Figure 7Climacogram of observed and simulated KT vs. white noise and a homogenized process without periodicities. In this implicit manner, the marginal characteristics of each periodic part are exactly preserved (since the marginal distribution functions are implicitly handled through the proposed homogenization) and the expectation of the second-order dependence structure (e.g. correlation function) is also exactly preserved after properly adjusting for bias through the mode or expected value of the estimator (Dimitriadis, 2017). It is noted that higher-order moments of processes with HK behaviour cannot be adequately preserved in an implicit manner (see an illustrative example in Dimitriadis and Koutsoyiannis, 2018, their Appendix D) and thus, for a more accurate preservation of the dependence structure an explicit algorithm is necessary (Dimitriadis and Koutsoyiannis, 2018). We may use a simple generation scheme, such as the sum of AR(1) models (SAR; Dimitriadis and Koutsoyiannis, 2015b), that can synthesize any N(0,1) autoregressive-like dependence structure, which later it can be transformed back to the original distribution function F(xi,j;pi,j) and so in this way produce a double-periodic process with the desired marginal distribution for each diurnal-seasonal cycle as well as the desired dependence structure. Finally, we multiply each value of the synthetic KT with the deterministically determined value of the hourly intensity of solar radiation at the top of the atmosphere. The hourly marginal distribution of solar radiation is investigated via the clearness index KT. Regarding the marginal distribution, after analysing a variety of stations with different regional climate data, it is concluded that the Kumaraswamy distribution cannot adequately describe the empirical data of hourly solar radiation. Therefore, a new bimodal distribution is constructed which is a weighted sum of two Kumaraswamy distributions This distribution is fully characterized by five parameters and can adequately fit the empirical hourly data of the clearness index in in the regions investigated in this study. Also, the dependence structure of solar radiation process is investigated via the climacogram tool. It is concluded that since the Hurst parameter is estimated higher than 0.5, the examined process exhibits long-term persistence and cannot be considered as a white noise nor a Markov process. Finally, a new preliminary stochastic model is proposed, capable of reproducing the clearness sky index KT and so the hourly solar radiation. The model can maintain and preserve the probability density function by means of the first four central moments and also the Hurst parameter which represents the correlation and the persistent behaviour. GK conceived of the presented idea, developed the theory and performed the computations. TI helped with R environment statistical tests. PD verified the analytical methods and encouraged GK to investigate the LTP behaviour of the solar radiation process. NM contributed to sample preparation. DK and PD supervised the findings of this work. GK took the lead in writing the manuscript. All authors provided critical feedback and helped shape the research, analysis and manuscript. The authors thank warmly the anonymous reviewers for their most helpful comments. The statistical analyses were performed in the R statistical environment (RDC Team, 2006) by also using the contributed packages VGAM (Yee, 2015), fitdistrplus (Delignette-Muller and Dutang, 2015) and lmomco (Asquith, 2018). Aguiar, R. and Collares-Pereira, M. T. A. G.: TAG: a time-dependent, autoregressive, Gaussian model for generating synthetic hourly radiation, Sol. Energy, 49, 167–174, 1992. Asquith, W. H.: Lmomco – L-moments, censored L-moments, trimmed L-moments, L-comoments, and many distributions, R package version 2.3.1, Texas Tech University, Lubbock, Texas, USA, 2018. Ayodele, T. R. and Ogunjuyigbe, A. S. O.: Prediction of monthly average global solar radiation based on statistical distribution of clearness index, Energy, 90, 1733–1742, 2015. Burnham, K. P. and Anderson, D. R.: Model selection and multimodel inference: a practical information-theoretic approach, Springer Science & Business Media, New York, USA, 2003. Csorgo, S. and Faraway, J. J.: The exact and asymptotic distributions of Cramér-von Mises statistics, J. Roy. Stat. Soc. B, 58, 221–234, 1996. 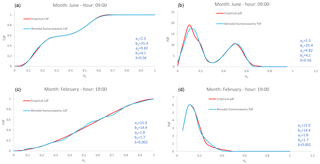 Deligiannis, I., Dimitriadis, P., Daskalou, O., Dimakos, Y., and Koutsoyiannis, D.: Global investigation of double periodicity of hourly wind speed for stochastic simulation; application in Greece, Enrgy. Proced., 97, 278–285, 2016. Delignette-Muller, M. L. and Dutang, C.: fitdistrplus: An R package for fitting distributions, J. Stat. Softw., 64, 1–34, 2015. Dimitriadis, P.: Hurst-Kolmogorov dynamics in hydrometeorological processes and in the mircoscale turbulence, PhD thesis, National Technical University of Athens, Athens, Greece, 167 pp., 2017. 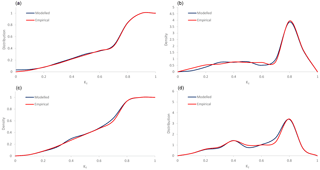 Dimitriadis, P. and Koutsoyiannis, D.: Climacogram versus autocovariance and power spectrum in stochastic modelling for Markovian and Hurst–Kolmogorov processes, Stoch. Env. Res. Risk A., 29, 1649–1669, 2015a. Dimitriadis, P. and Koutsoyiannis, D.: Application of stochastic methods to double cyclostationary processes for hourly wind speed simulation, Enrgy. Proced., 76, 406–411, 2015b. Dimitriadis, P. and Koutsoyiannis, D.: Stochastic synthesis approximating any process dependence and distribution, Stoch. Env. Res. Risk A., 32, 1493–1515, 2018. Ettoumi, F. Y., Mefti, A., Adane, A., and Bouroubi, M. Y.: Statistical analysis of solar measurements in Algeria using beta distributions, Renew. Energ., 26, 47–67, 2002. Harrouni, S., Guessoum, A., and Maafi, A.: Classification of daily solar irradiation by fractional analysis of 10-min-means of solar irradiance, Theor. Appl. Climatol., 80, 27–36, 2005. Hollands, K. G. T. and Huget, R. G.: A probability density function for the clearness index, with applications, Sol. Energy, 30, 195–209, 1983. Jones, M. C.: Kumaraswamy's distribution: A beta-type distribution with some tractability advantages, Stat. Methodol., 6, 70–81, 2009. Jurado, M., Caridad, J. M., and Ruiz, V.: Statistical distribution of the clearness index with radiation data integrated over five minute intervals, Sol. Energy, 55, 469–473, 1995. Koudouris, G., Dimitriadis, P., Iliopoulou, T., Mamassis, N., and Koutsoyiannis, D.: Investigation on the stochastic nature of the solar radiation process, Enrgy. Proced., 125, 398–404, 2017. Koutsoyiannis, D.: The Hurst phenomenon and fractional Gaussian noise made easy, Hydrolog. Sci. J., 47, 573–595, 2002. Koutsoyiannis, D.: HESS Opinions “A random walk on water”, Hydrol. Earth Syst. Sci., 14, 585–601, https://doi.org/10.5194/hess-14-585-2010, 2010. Koutsoyiannis, D.: Hurst–Kolmogorov dynamics as a result of extremal entropy production, Physica A, 390, 1424–143, 2011. Koutsoyiannis, D., Yao, H.. and Georgakakos, A.: Medium-range flow prediction for the Nile: a comparison of stochastic and deterministic methods, Hydrolog. Sci. J., 53, 142–164, 2008. Marsaglia, G. and Marsaglia, J.: Evaluating the anderson-darling distribution, J. Stat. Softw., 9, 1–5, 2004. Moschos, E., Manou, G., Dimitriadis, P., Afentoulis, V., Koutsoyiannis, D., and Tsoukala, V. K.: Harnessing wind and wave resources for a Hybrid Renewable Energy System in remote islands: a combined stochastic and deterministic approach, Enrgy. Proced., 125, 415–424, 2017. Pizarro, A., Dimitriadis, P., Chalakatevaki, M., Samela, C., Manfreda, S., and Koutsoyiannis, D.: An integrated stochastic model of the river discharge process with emphasis on floods and bridge scour, European Geosciences Union General Assembly 2018, vol. 20, 11 April 2018, Vienna, Austria, EGU2018-8271, 2018. Reno, M. J., Hansen, C. W., and Stein, J. S.: Global horizontal irradiance clear sky models: Implementation and analysis, Tech. Rep. SAND2012-2389, Sandia National Laboratories, Albuquerque, New Mexico and Livermore, California, USA, 2012. RDC Team (R Development Core Team): R: A Language and Environment for Statistical Computing, R Foundation for Statistical Computing, Vienna, Austria, 2006. Tovar-Pescador, J.: Modelling the statistical properties of solar radiation and proposal of a technique based on boltzmann statistics, in: Modeling Solar Radiation at the Earth's Surface, Springer, Berlin, Heidelberg, Germany, 55–91, 2008. Tsekouras, G. and Koutsoyiannis, D.: Stochastic analysis and simulation of hydrometeorological processes associated with wind and solar energy, Renew. Energ., 63, 624–633, 2014. Yee, T. W.: Vector generalized linear and additive models: with an implementation in R, Springer, New York, USA, 2015.